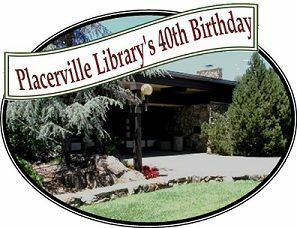 In celebration of the Placerville Library's 40th anniversary on Fair Lane, the El Dorado County Historical Museum has developed a presentation to introduce you to the people of the past who lived and worked in the area surrounding our current Government Center and Library. The people associated with this area represent the earliest arrivals to the Gold Rush. They were miners, farmers, ranchers, business men, entrepreneurs, and politicians, including single independent women. Aerial photos will show how the area has changed over the last 80 years. Dee Owens, a Research Volunteer with the County Museum, will explain how you can discover the history of a locality using historical maps, aerial photos, the Internet, and resources found at the El Dorado County Historical Museum's research room. Sponsored by Friends of the Library and El Dorado County Historical Museum.